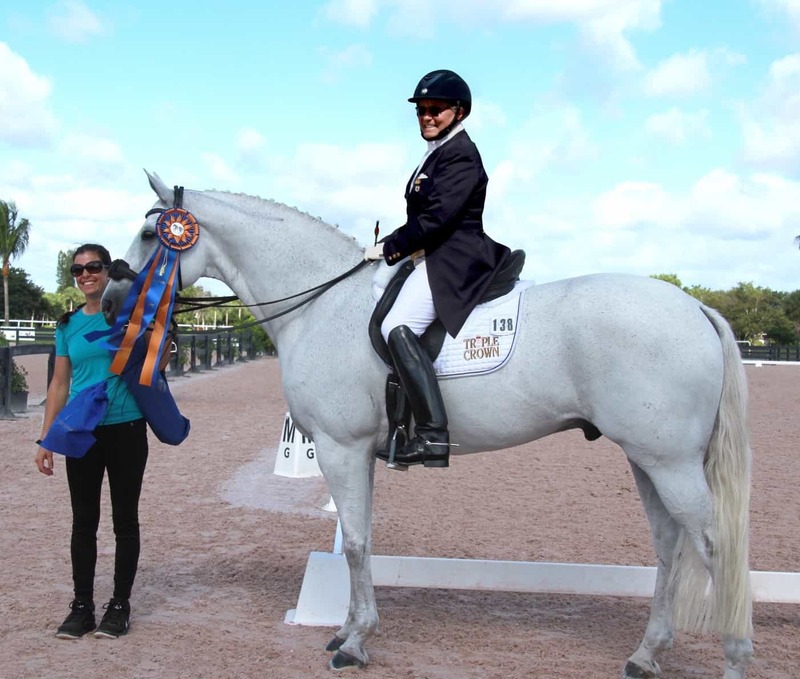 , Friday, January 27, 2017 — Wellington, FL (January 20, 2017) – Susan Blinks and Habanero L brought their talent in full force to their first show at the 2017 Adequan Global Dressage Festival in Wellington, Florida, bringing home a blue ribbon in the Intermediate I division. Blinks and Habanero L, a 13-year-old Hanoverian gelding (His Highness x Wolkenfee, Wolkenstein II) owned by Leatherdale Farm and Louise Leatherdale, also earned the Accuhorsemat Accuracy Award for their winning test. As a sponsor of the 2017 Adequan Global Dressage Festival, Acuswede, the North American distributor of the innovative equine acupressure blanket Accuhorsemat, is proud to recognize riders and horses that complete accurate rides throughout the 2017 winter dressage show season. Acuswede presented Blinks and her mount with an Acuswedemat (acupressure therapy mat for humans), an Accuhorsemat sports pack, and a commemorative ribbon. Blinks also earned the possibility to experience the best of both worlds – the opportunity to schedule a complimentary therapy session for her horse with an Accuhorsemat, while she relaxes with her very own Acuswedemat. The Accuhorsemat Accuracy Award will continue to be presented throughout the show circuit (which concludes on March 25, 2017) to riders with exemplary, accurate tests. Blinks, a past Olympic Team Bronze medalist, was honored to be rewarded for her accurate riding. “That’s what it’s all about – little details,” said Blinks. She was happy to share her award with Habanero, who she has been riding just a little over a year. Her favorite thing about the gelding is his character. “He’s just amazing,” she said. Accuhorsemat is an innovative equine acupressure blanket that reduces tension and soreness in horses to improve mobility, performance, and overall health. Both Acuswedemat and Accuhorsemat combine classic acupressure and Swedish innovation into a portable mat that applies pressure to multiple points in the body. Using these products regularly increases circulation and accelerates muscle recovery and healing, as well as activates the body’s natural endorphins to create an overall feeling of well-being. A thermography study found that the Accuhorsemat significantly increases blood flow in as little as 15 minutes. Regular use actively assists equine and human athletes in removing tension in connective tissue, which will improve flexibility and strength and help avoid injury. The Accuhorsemat can be used before riding to improve warm-up, after riding to accelerate muscle recovery, and in between massage/chiropractor/acupuncture sessions to maintain mobility and overall health. Accuhorsemats and Acuswedemats are now conveniently available at The Tackeria, located directly across the street from the Adequan Global Dressage Festival show grounds. Originally developed in Sweden, the blankets for performance horses and the mats for people are quickly spreading in popularity throughout North America. Acuswede is proud to support equestrian competition through its sponsorship of the Adequan Global Dressage Festival series as well recognizing worthy equestrians and their mounts with the Accuhorsemat Accuracy Award. Photo: Olympian Sue Blinks Wins Accuhorsemat Accuracy Award on Habanero at Adequan Global Dressage Festival.